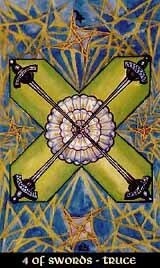 The Four of Swords has reached the fields of Chesed, manifestation and condensation, the winds of mind have settled and the powers of the element are well-balanced in themself. The mind has solved a problem, found a solution, completed a process, or has come to a good, satisfying compromise. Jupiter keeps the scales of the libra in harmonious balance, and the truce can be enjoyed full-hearted. Though, for the Air stability means stagnity, therefore the restful truce should be used for reflection and reconsideration, the idea that has become full circle in the calm realms of Chesed needs to proceed to further levels.